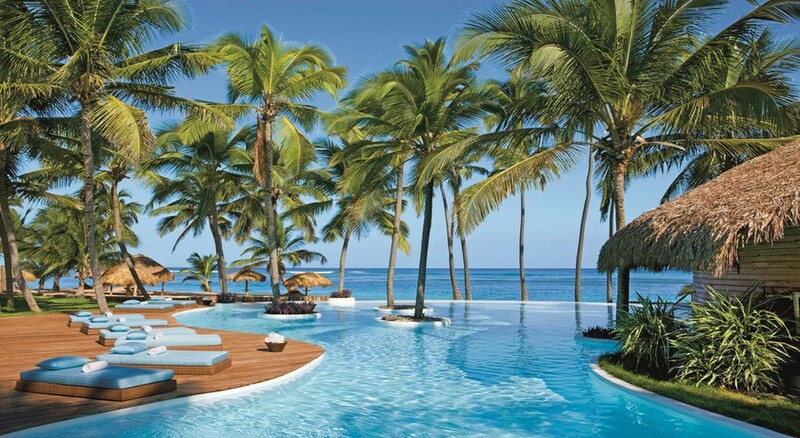 If you're looking for relaxing holiday in the sun, then Zoetry Agua Punta Cana is the perfect place to you stay. 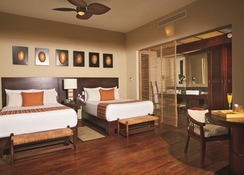 It is a family-friendly and couple-friendly hotel set on an idyllic beach surrounded by palm trees. This large and impressive resort adds a touch of luxury to your holiday with a spa and a large refreshing pool. With luxurious suites, swimming pools, excellent golf courses nearby and plenty of water-sports to try out, Zoetry Agua Punta Cana is the perfect place to stay for a fun-filled holiday. Over the years the resort has bolstered its position as ‘favourite’ among couples, honeymooners and families looking for a sunny beach break in the lap of luxury. 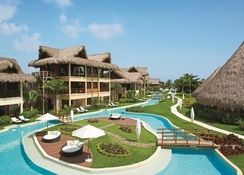 Zoetry Agua Punta Cana is located in Punta Cana opposite a beach surrounded by palm trees. The Punta Cana International airport is 46.7km from the hotel. Palma Real Shopping Village is 32.7km from the resort, which can satisfy your luxury shopping needs. 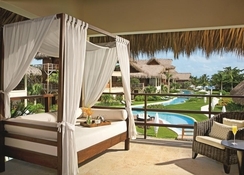 Zoetry Agua Punta Cana has well-furnished air-conditioned suites and villas. They are categorised as Villa Caney Garden View, Villa Dominicana Garden View, Villa Caribe Garden View, Penthouse Suite Ocean View, Junior Suite Ocean Front Deluxe, Junior Suite Ocean Front, Romantic Junior Suite Agua Swim Up, Romantic Junior Suite Agua Swim Up, Romantic Junior Suite Taino Garden View, Romantic Junior Suite Pool View, Junior Suite Pool View, Junior Suite Garden View and Romantic Junior Suite Garden View. 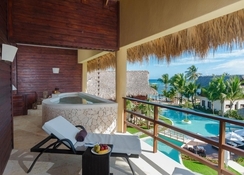 Some of the amenities in the suites include king-sized bed, bathroom with deep soaking tub, separate shower, double vanity & walk in closet and tropical garden view from private terrace or balcony. There are five indoor dining and drinking options in the hotel that include Amaya, Coco Café, Indigo, Olena and Piragua. The breakfast is largely continental, with hot and cold items and fresh bakes. At lunch and dinner local and international cuisine is served. Wines, other alcoholic and non-alcoholic drinks are served during lunch and dinner. The hotel also houses a large beach-front bar, which serves local and international drinks and snacks. 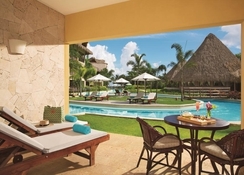 In addition to this, there is a swim up wet bar, which serves drinks and snacks to guests relaxing by the pool. The hotel features a large outdoor swimming pool with Sunbeds and parasol. It will be an exciting time for the golf lovers, as there are plenty of golf courses close to the hotel, including Cocotal Golf & Country and La Cana Golf Course. For fitness enthusiasts, there is fitness centre as well as a wellness centre. The spa offers expert masseurs who give relaxing massages and numerous beauty treatments. On the beach, activities to try out include sailing, snorkelling, scuba diving, fishing, jet skiing, kite sailing and more.